West Bromwich Albion have brought back Terry Burton to The Hawthorns as technical director as part of their end-of-season backroom shake-up. Following head coach Pepe Mel's sacking on Monday, Albion have brought in Burton, 61, to work alongside Richard Garlick, the club's sporting and technical director since March 2013. Burton is leaving his post as Arsenal's head of youth coaching. 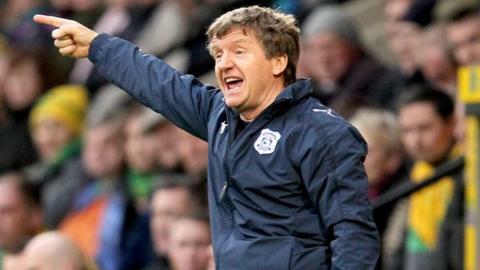 Terry Burton spent four months as Albion first-team coach under Roy Hodgson, now the England manager, during the 2011-12 season. Richard Garlick has operated as Albion's sporting and technical director for the past 14 months, during which time the Baggies have sacked two coaches, Steve Clarke and Pepe Mel, and slumped from the Premiership's Top 10 to the brink of relegation. He worked briefly as Albion coach under Roy Hodgson two seasons ago. "Terry made a lasting impression during his time here two seasons ago and comes highly recommended for his new role. His knowledge and experience of the game is second to none," said Albion chairman Jeremy Peace. Garlick, 38, stepped up from being Albion's legal director-secretary to replace Dan Ashworth, when the latter became the Football Association's director of elite development in the summer of 2013. He will remain at the club as director of football administration in what an official club statement referred to as "a realignment of duties" and he will help find a replacement for Mel, Albion's second managerial casualty of the season, following the departure of Steve Clarke in December. "Richard has worked tirelessly as sporting and technical director and remains a key member of the board," said Peace. "However, with the responsibilities of the position becoming increasingly wide-ranging, we felt it would be wise to split the role."